FundRacers is happy to offer families a discount on registration for this race. The discount applies when you register 4 people. You don't have to do anything to request the discount. The discount is calculated automatically by our system, and will show up in your order basket once the 4th person is added to your registration. Keep in mind the discount applies only to the first 4 people you register. After that, registration charges are calculated at the regular price in effect at the time you submit your registration. The family discount only applies when 4 people are registered for the same event. While we encourage families to take advantage of the discount, please keep in mind that any discounts provided can adversely affect the amount of money raised for the event's cause. Course Info: The race begins and ends behind McKendree Elementary. Awards: Trophies will be given to the top overall male and female finishers as well as masters male and female overall winners. Medals will be given to the top three finishers in male and female 5 year increment age categories from 10 and under to 65 and up. 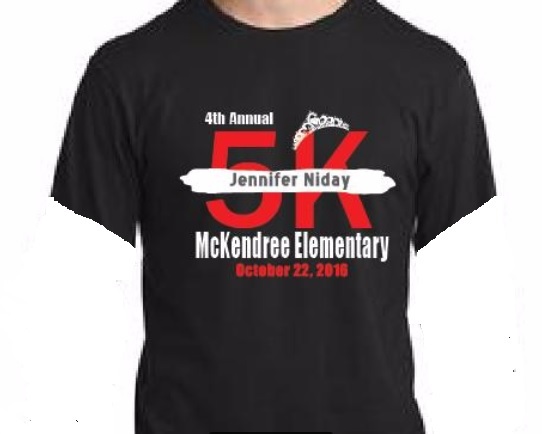 Jennifer Niday was a loving wife, mother, daughter and friend and Assistant Principal at McKendree Elementary who was taken from us much too soon. Join us for a fun morning of music, post race snacks, doorprizes and of course the run as we remember and honor Jennifer.